Edition of music used is not specified. Repetition is arbitrary. However, performance time for each round must be strictly adhered. Participants do not need to perform from memory. The titles of the chosen pieces must be stated in the relevant section of the application form. 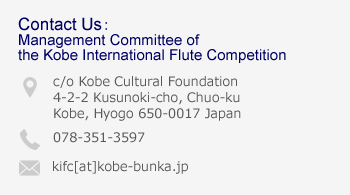 No changes in the selected repertoire will be accepted after the submission of the application. In the case of choosing piece i) from Group (3) of the Third Round, a copy of the music must be submitted along with the recorded CD for the Preliminary Screening. Record the applicant’s performance in the following order: one piece from Group (1) and one piece from Group (2). *Recording media for the Preliminary Screening should be in audio CD format only, and the recording must not be edited in any way. Make sure the recorded CD must be playable on CD players in general use. *Applicants are required to record his/her own name before performing the piece from Group (1). This is to ascertain the proper pronunciation when expressed in written Japanese. Perform pieces from Group (1), (2), and (3). Duration of total performance must be less than 20 minutes. Perform one piece from each Group (1) and (2). Duration of total performance must be less than 25 minutes. Choose one from a) to d). Piano accompaniment only. Perform one piece from each Group (1), (2), and (3). Duration of total performance must be less than 35 minutes. Official accompanists will be commissioned by the organizer. Participants cannot appoint a particular official accompanist by themselves. Contestants who bring their own accompanist must bear all expenses for the accompanist. Finalists must play with the orchestra and the conductor commissioned by the organizer. Contestants will have opportunities to rehearse with a piano accompanist, regardless of the official accompanist or the contestant’s own accompanist. Rehearsal time with the accompanist is 70 minutes (approximately 55 minutes in the rehearsal room and 15 minutes on the stage) for the Second Round and 70 minutes in the rehearsal room for the Third Round, according to the schedule designated by the Management Committee. Finalists will have one rehearsal opportunity with the orchestra on the day before the Final Round. All rehearsals are closed to the public except personnel authorized by the organizer.